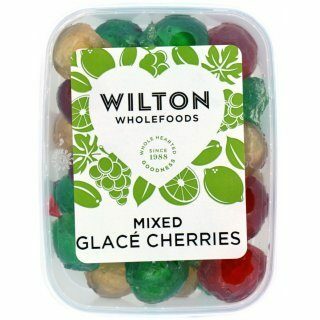 Our mixed glace cherries are perfect for home baking. They are great for cake decorating and also for use as an ingredient. Try using these cherries for decorating a Dundee, Christmas, or fruit cake. Cherries, Sugar, Glucose-Fructose Syrup, Citric Acid, Colour E102, E104, E131 & E163, Preservative E202 & Sulphur Dioxide. Smooth transaction, lovely product, love the fact that they are in little tubs, very handy, cant wait to use them in my Xmas cake thank you. Would recommend, plus they have a good long shelf life which is excellent. I ordered 3 packs of glacé cherries (which I needed urgently for Xmas baking) at 8am yesterday, and they arrived at 8am today! They look perfect and have a long expiry date which is great. Thank you to Wilton foods, you saved me having to spend half a day in Leeds trying to find some! I had tried Waitrose, and lots of other supermarkets without success.This is a genuine review. I was unable to get the mixed colour glace cherries anywhere but then discovered them on Wilton Wholefoods site. Ordered on the Sunday, as I live not far away I picked up on the Monday. Very prompt service, would definitely use again.